In 1855, the present frame church building was built. About ten years later, a reed organ was introduced into the church service. According to records of the Moeller Organ Company, a one-keyboard pipe organ of 18 ranks was built in 1889 for the First Presbyterian Church of Caledonia and installed in the sanctuary 34 years after the church was built. The air for this pipe organ was hand-pumped by boys for many years. When this organ was installed, the choir loft was shifted from the southwest corner of the sanctuary to the area directly in back of the pulpit. In 1889, when this organ was installed, the church membership was 170. Perhaps because this Moeller Organ was a one-keyboard organ, it was replaced in 1912 after 23 years, by a two-keyboard, 15 rank instrument built by Carl Barckhoff at a cost of $9450. This organ was pumped by water pressure until 1928. The first pipe organ, the Moeller, may have been sold, taken in trade by Barckhoff, or broken up for parts with some of the pipes possibly being used in the Barckhoff organ. It is possible that it is the Barckhoff facade that existed in the church until the recent renovations. What happened to the Barckhoff pipe organ is uncertain. It has been rumored that this organ was broken into parts also. In 1950, a bequest from Roy Outterson, who had been the organist for 40 years, was designated by the Trustees as the start of an organ fund to commemorate Mr. Outterson’s long service. Since the 40 year old Barckhoff tracker-equipped pipe organ was in need of extreme repair at a cost of $5000, an electronic Allen C- 3 organ was purchased and the preliminary installation was done in 1952 for $5830. This organ, which the congregation voted to install, consisted of the console and more than half the sound possibilities with two extra speakers. The total completed cost of the Allen electronic organ was $8500 in 1952. A few years later, the organ’s installation was completed. This organ served the congregation for over 30 years. In March of 1984, a committee was designated by the Session of the First Presbyterian Church to look into the possibility of purchasing an organ. Through the Organ Clearing House (an independent clearing house established for the preservation of pipe organs), an organ was located and purchased in December 1984. During the time period between December 1984 and May 1987, the congregation of the First Presbyterian Church undertook a massive fund drive. Many people also designated Memorial Gifts to the Organ Fund. During the entire time period, many people volunteered time and money to make our dream come true. The present organ, the Memorial Organ is an E. and G.G. Hook and Hastings Organ, Opus 829, built in 1876 for the Andover Theological Seminary in Andover, MA. Elias and George Greenleaf Hook dominated the organ building business in New England during the 19th century. They were apprenticed to a Boston organ maker in 1824. In 1827 they returned to Salem, MA, and set up a successful organ firm of their own. The firm rapidly grew, and in 1831 they returned to Boston. During the next 40 years, they produced over 600 instruments of all sizes, and established themselves as one of the foremost organ building firms in the United States. In 1872, they entered into a partnership with Francis Hastings, and after 1881, the company was known as Hook and Hastings. The company ceased operations in 1936, having built more than 2500 instruments. Those organs that still exist are “speaking monuments” to the fine craftsmanship of their makers. Before being installed in Caledonia, the organ was located in the Baptist Church of Clinton, CT. 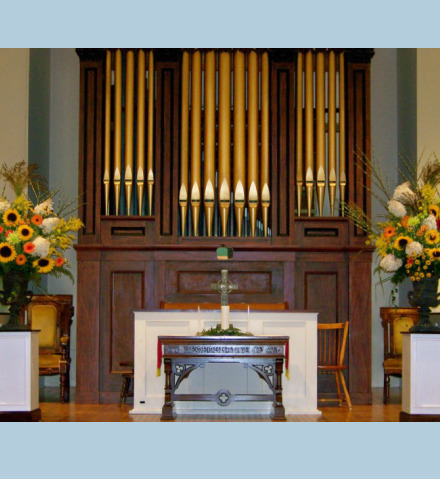 Through the Organ Clearinghouse (an independent clearinghouse established for the preservation of pipe organs), the Hook and Hastings organ was located and purchased by First Presbyterian Church, Caledonia, in December 1984. The organ’s case was built in 1841 by William Stevens. It originally housed an organ in the Metropolitan Baptist Church in Roxbury, MA. In 1975 that organ and its case were removed from the Roxbury church, and were placed in storage at Andover Organ Company. Because the Hook and Hastings organ did not have a case of its own, the Roxbury case was purchased from the Andover Organ Company; the rebuilding and expansion of the organ, and the refinishing of the case, were done under contract with the Andover Organ Company of Methuen, MA. While Andover Organ Company replaced bushings and leathers, and installed the case, the basic structure and mechanism of the original organ remain unchanged. The instrument is completely mechanical in action. The only electrical element is the blower, which provides air to the bellows. The organ has 16 ranks of pipes (a total of 866 pipes) and 14 stops (different tonal qualities). The principal stop in the pedal consists of twenty pipes from an old Barckhoff organ, which had been installed at First Presbyterian in 1912, serving for 40 years, until 1952.